Fiscal year 2017 saw an estimated 1 percent increase in both total external funding and funding that supports research and scholarship at the University of Iowa. Total external funding (which includes gift commitments and charitable grants supporting research through the UI Foundation) rose from $551.9 million in FY16 to $557.7 million in FY17. 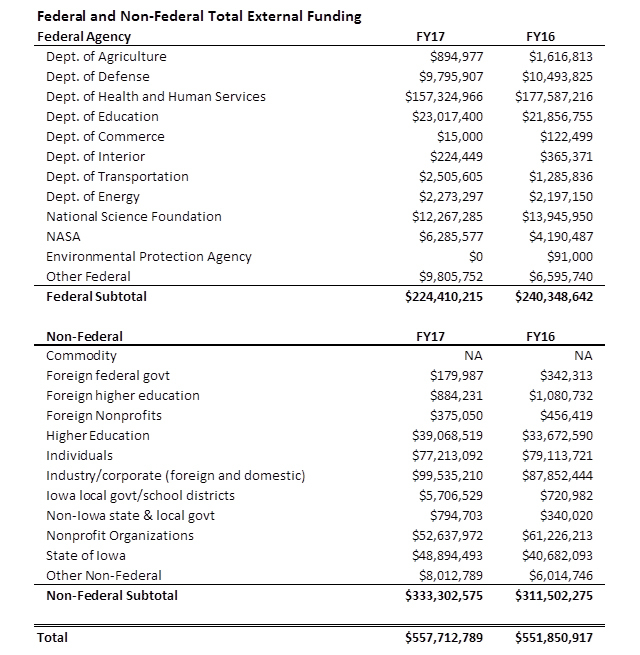 Meanwhile, grants and contracts that support discovery at the UI increased from $437.9 million to $443.3 million—the most dollars awarded to the UI since FY11. The College of Engineering was particularly successful in FY17, with a 72 percent increase in funding over last year. The bump stems in part from a $6.5 million award from the U.S. Department of Housing and Urban Development supplemented by additional cost sharing from the state of Iowa to Professor Larry Weber for a project to study the Iowa watershed and a $3 million National Science Foundation (NSF) grant for Associate Professor David Cwiertny to develop a Sustainable Water Development graduate program. 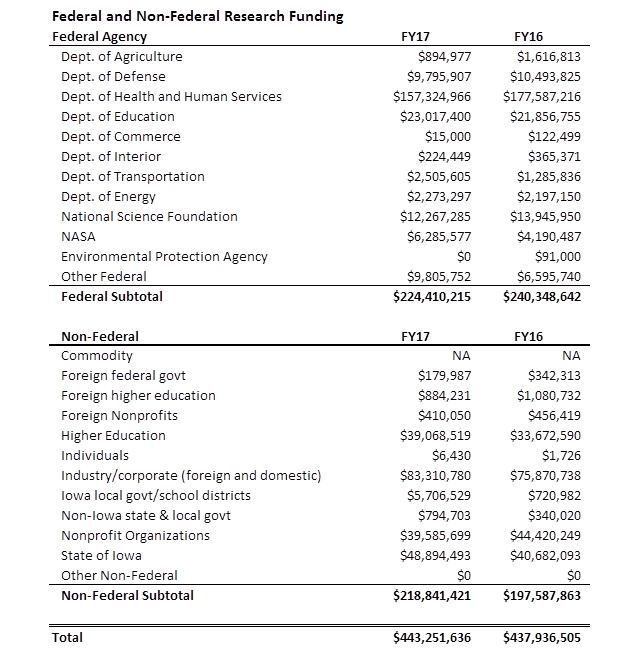 Despite the overall increase in funding, Dan Reed, UI vice president for research and economic development, says federal dollars for UI research have continued to contract by an average of 1.4 percent per year over the past decade. This decrease includes less competitive biomedical research funding from the National Institutes of Health (NIH). Reed says that’s all the more reason why universities like Iowa need to nurture more creative, ambitious, and interdisciplinary research proposals, something his office’s newly formed Research Development Office is seeking to accomplish. Despite the challenges, Reed emphasizes that scholars and researchers at Iowa continue to seek answers to life’s important questions. The Healthier Workforce Center of the Midwest in the UI College of Public Health received a $16.3 million grant from the Center for Disease Control (CDC) National Institute for Occupational Safety and Health (NIOSH). The center was established to protect and preserve worker safety and health through the application of research-proven best practices. UI researchers are taking on the opioid epidemic with a novel non-pharmaceutical approach, leveraging a $708,542 grant from Pfizer and the American Pain Society. Kathleen Sluka, professor of physical therapy, and Barbara Rakel, professor of nursing, are piloting a program encouraging the “prescribing” of targeted exercises and transcutaneous electrical nerve stimulation (TENS) to patients suffering from chronic musculoskeletal pain. The goal is to encourage primary-care physicians to recommend non-drug therapies instead of prescription pills. As obesity and diabetes affect an increasing portion of the population, Philip Polgreen, associate professor of internal medicine and epidemiology, received a $228,750 grant to develop a mobile health (mHealth) intervention for patients at risk for Type 2 diabetes. The Gates Foundation is supporting the research of Associate Professor of Epidemiology Kelli Ryckman estimating the gestational age of a fetus with metabolic biomarkers measured using newborn blood specimens. In countries with limited access to prenatal care and ultrasound, this could be a groundbreaking model for accurately surveying gestational age and ultimately preventing preterm birth. Iowa also continues advanced driving safety research. Dan McGehee, director of the National Advanced Driving Simulator, received two grants totaling $1.6 million toward continued research into vehicle safety related to human factors and automated-vehicle testing in Iowa. Research awards are also driving the continued scholarship of UI humanities, education, and library sciences faculty. Susan Assouline, College of Education professor and director of the Belin-Blank Center for Gifted Education and Talent Development, received a nearly $2 million NSF grant to better identify and support rural middle school students who have high potential for academic success as a way to promote computer and IT knowledge, advanced quantitative knowledge, and STEM skills. Ten school districts in rural Iowa will be chosen for the study, although the results could have national impact on workforce development. Katina Lillios, professor in the Department of Anthropology, received a $50,400 grant from the National Endowment for the Humanities (NEH) to support her writing of the book Archaeology of the Iberian Peninsula: From the Paleolithic through the Bronze Age. The U.S. National Archives and Records Administration and National Historical Publications and Records Commission awarded a $93,632 grant to the UI Libraries and State Historical Society of Iowa to digitize a collection of 1,100 oral history interviews with Iowa workers. The Iowa Labor Oral History Project interviews document the memories of workers and union members across Iowa stretching as far back as the 1890s. An exhibit about this project is currently touring the state in the UI Mobile Museum.